Here’s a little fella who looked up at me before plopping down onto the ground and out of sight right there in front of me as I watched. If you didn’t know he was there you would not have seen him. From most angles I could not see him, even though I knew exactly where he was! It is only because he moved a little that I was able to relocate him again. For a while he engaged in some scratching and grooming. Then he was down and out and unfindable again! 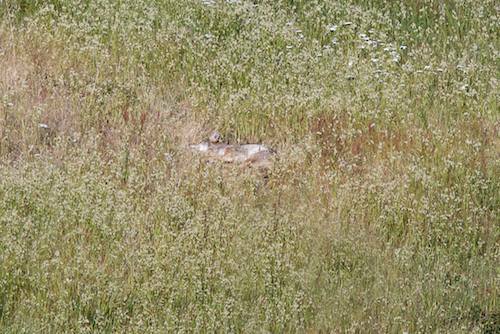 I can’t believe I spotted this little coyote asleep this way — tucked in under a tree in a spot of sunshine! Without the sun right on him, I would never have seen him. It’s almost too cute with his paws curled up over his snout. I wanted to post it for the holidays and to wish you all Peace and Goodwill amongst humans and animals! To make it fit in with the season, I wanted to call this posting “a long winter’s nap” — but after thinking about it, I added a question mark. 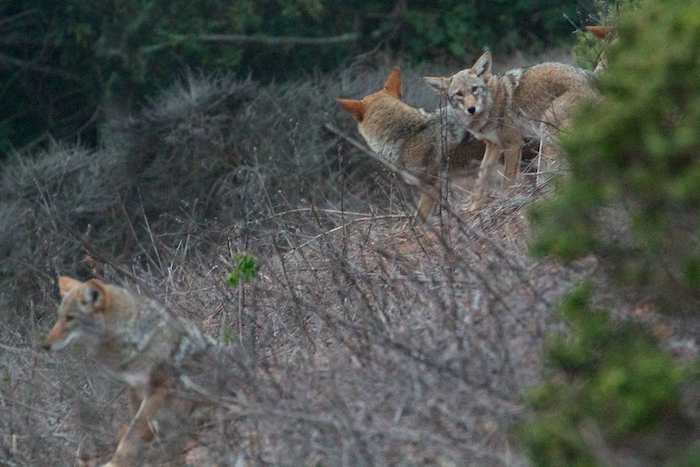 At this time of year, the nights are the longest they’ll be all year, so it’s appropriate to call a full night’s sleep a “long winter’s nap.” But this is sort of reversed for coyotes. 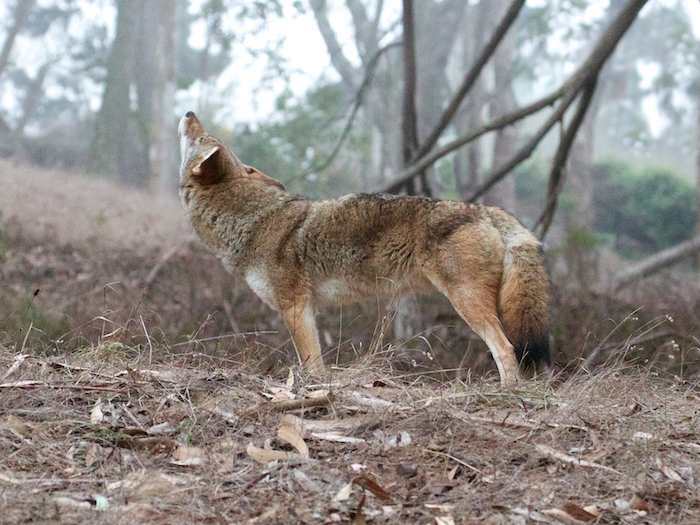 Although coyotes are not nocturnal, they have adapted their schedules in order to avoid humans and human activity during the day. For the most part, they are out and about at dawn, dusk and nighttime, and they spend the vast portion of daylight hours hidden away and sleeping. 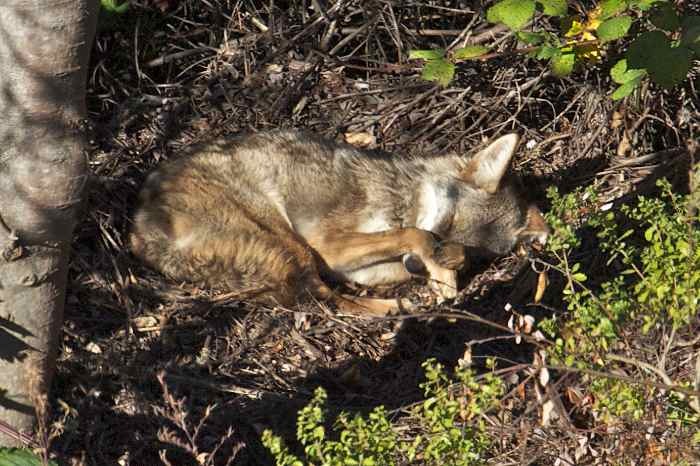 So since there are fewer daylight hours right now, it occurred to me that maybe coyotes are actually getting only ” a short winter’s nap”? If that is the case, they’re probably making up for any lost daytime sleep by taking nighttime “catnaps” when they need them! I arrived at one of my parks earlier than I had anticipated. It was before dawn, but I didn’t want to wait in the car, so I headed into the park. 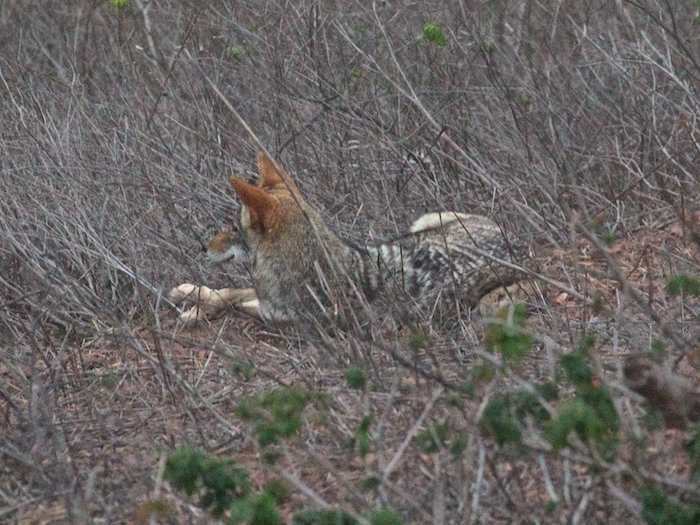 A coyote was sleeping out in an open field — a mound of fur on the ground. 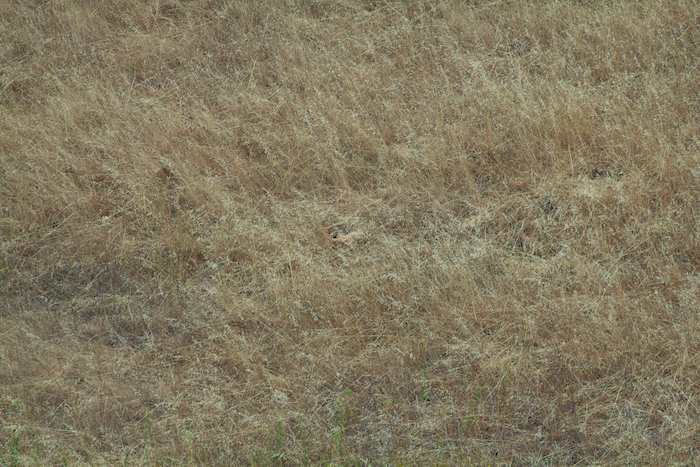 She was really well camouflaged — I don’t think anyone else would have detected her there. I took out my camera to videotape the stillness — the video function works wonderfully in bad lighting. 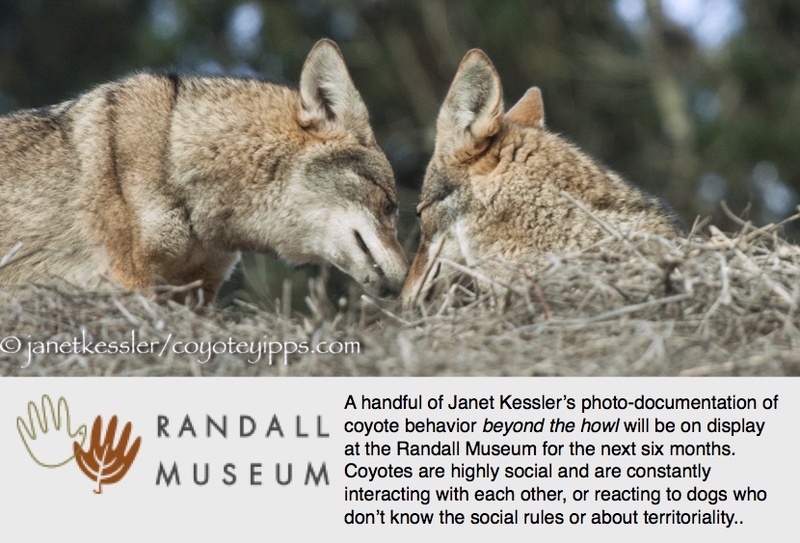 The coyote casually lifted her head and looked around, and then looked at me. She hadn’t had her fill of sleep: “Need more sleep.” Okay! She put her head back down, and I went on. 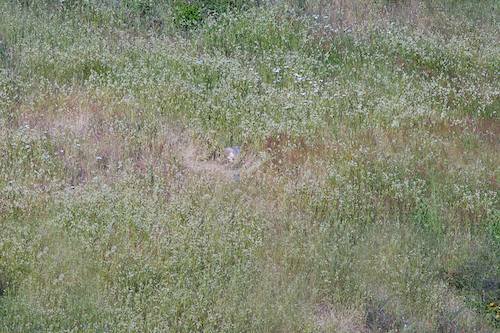 Earlier on, this coyote had been pursued by dogs. It is now resting here, hoping that by lying completely still, no human or dog will see it. In fact, no one did see it while it was here. 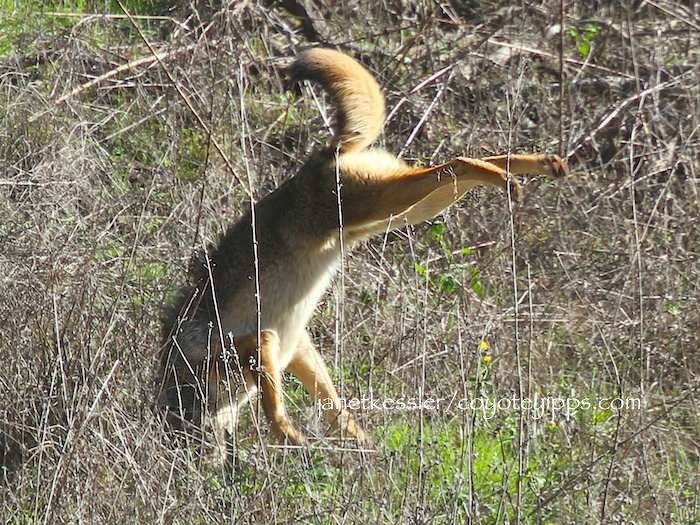 When the coyote was ready to go, it got up, stretched, and trotted off.